The Lady Nelson sails regularly on Saturdays and Sundays. You can relax and take in the scenery or get involved with sailing the ship. The number and type of sails set depends on the weather, the crew and the number of passengers. 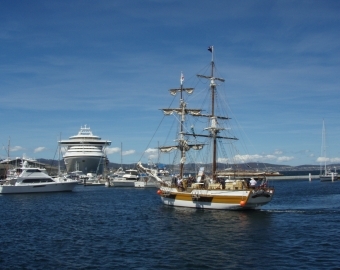 Come aboard, relax and experience tall ship sailing in one of the world's most picturesque harbours. Harbour Sails last for 90 minutes, so please ensure you have adequate clothing to stay warm and dry. Some coats can be provided if required. Sailing on the Lady Nelson is very popular so bookings in advance are recommended. Our standard saiing times are 11am and 1pm on weekends but additional 3pm saiings during peak periods may also be available.